Dear Android Police readers, I must apologize for not being as dedicated as before to WhatsApp's teeny changes in the past few weeks. I won't try to find excuses, but I will promise to be more vigilant and start making it up by telling you about two small features you may not have noticed yet. One of them is probably a few months old, the other is only a few days late. First, and this was pointed out by our tipster Nitin, is the fact that WhatsApp can re-download media that was deleted from the device's storage. I can't say how new (or old) this is. It's been years since I've deleted some WhatsApp media, but a friend did so several months ago and asked me how to get them back. The option wasn't there then. So the best I can guess is that it's relatively new-ish. 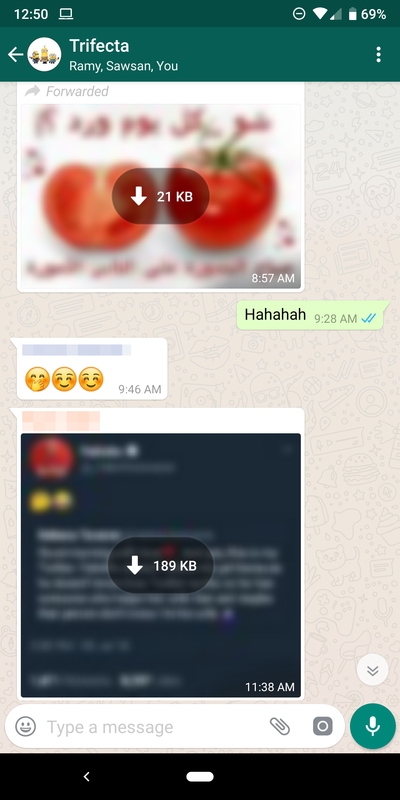 Now, when you delete media from your phone's storage (through the gallery or a file manager, not from WhatsApp itself), you can go back to the conversation in WhatsApp and you'll find the blurred thumbnail there with a download button again. Tap it, and you'll have your images back. I've tested it with images, GIFs, videos, audio, and documents, so you should be able to get back anything you mistakenly erased. However, I don't know how far back the retrieval works, I only tested relatively new media received in the past few weeks. In case you didn't know about this and you thought all would be lost when something is deleted, this small tip should ease your concern. Erased media can be re-downloaded. Next is a relatively new feature that lets you hide downloaded media from your gallery. The setting showed up as far back as late May in the beta version of WhatsApp, but wasn't working then. It became functional in the past week. 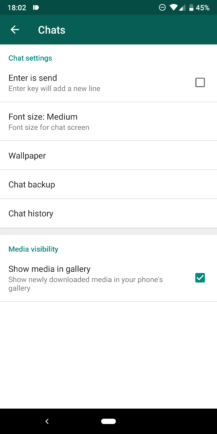 There are two tiers to hiding media: one that works for the entire app, and another that lets you specifically change the setting per chat/group. You can find Media visibility under Settings -> Chats. 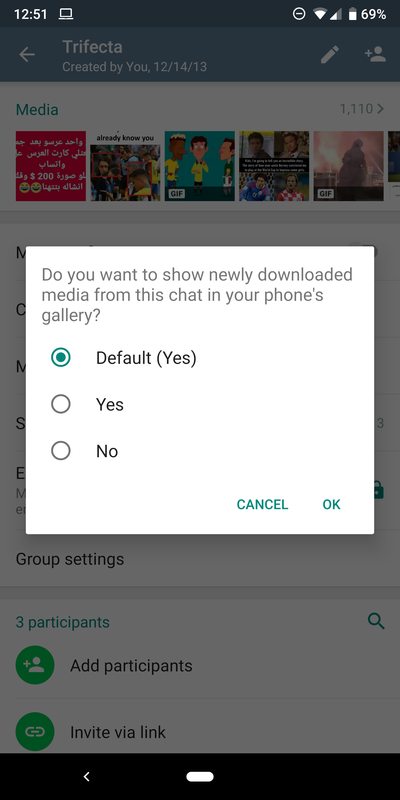 Disabling it will stop showing all newly downloaded media (from then on) in your gallery. If you want the granular control, you can head to any chat or group's info page and tap on Media visibility there. Three options will be available: yes, no, and the default setting you chose. I won't ask about the reason you're doing this, but it's working now should you need it. 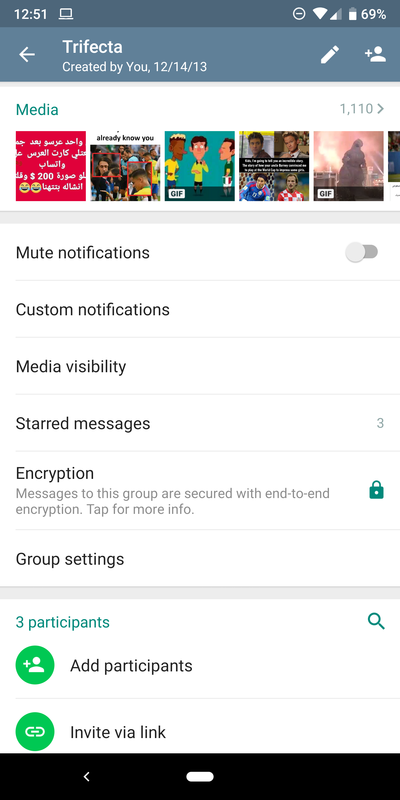 Both features are now working for me in WhatsApp 2.18.205 beta (APK Mirror), but as I mentioned many times already, odds are they were implemented several versions ago.